Starting under the moniker ROADKILL, this Norwegian quartet became TONIC BREED in the fall of 2007, releasing their debut album “On the Brink of Destruction” in 2010 and a couple of singles in 2012. The second full-length “Outsold” is my first exposure to this band’s style, which appears to be a mix of Traditional, Power, and Thrash Metal the Bay Area way based on numerous playbacks. After a mysterious keyboard oriented set up, the hyper fast snare and rhythm barrage of “Strife” tells you we are dealing with a band that love HEATHEN, FORBIDDEN, and a healthy smattering of the British XENTRIX- as well as the addictive James Hetfield orientated snarl from guitarist/ vocalist Patrik Svendsen. The follow up “Fifth Estate” features some interesting stair step riffs and melodic elements between Patrik and fellow guitarist Thomas Koksvik that rivals a lot of the best Bay Area Thrash teams in the business. Bassist Rudi Golimo and drummer Mats Johansen lead through subtle tribal bottom end maneuvers on another highlight “Outsold”, while the longest track at 8:11 “Borregaard” is an instrumental offering that features intricate clean to heavy transitions and has of course that echoing METALLICA charisma. Spirited neo-classical oriented lead work segues into a heads down riff-fest on the closer “There’s Just One Escape” – featuring all the tricks of the Power / Thrash trade with vocals often following the guitars and the right amount of gang vocals emphasizing key words and phrases. The production values are of a major independent label quality – it’s an impressive investment on the band’s part, and as a result helps shape the overall product in a higher light. “Outsold” works because you don’t hear a lot of newer bands performing in this slightly advanced Power / Thrash way anymore, and as such as major appeal to those who want something a little more musically inclined than a typical straightforward act. 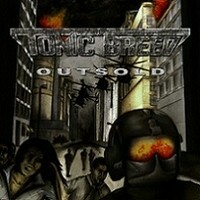 TONIC BREED could easily advance up the ranks thanks to this impressive release.